Funeral Directors in Illinois are required to complete 12 hours of continuing education every renewal period. Funeral Directors who are also Embalmers in Illinois are required to complete 24 hours of continuing education every renewal period. NOTE: Only 6 of the 12 hours can be done via home study or online for Funeral Directors; 12 of the 24 hours may be home study for those with both Funeral Directors and Embalmers licenses during a single renewal period. 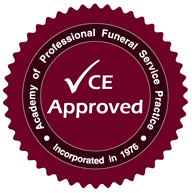 Funeral Service Academy has been approved as a Continuing Education Sponsor by the Illinois Department of Financial and Professional Regulations.